Welcome to Jordan River Village's A&F Challenge team page! 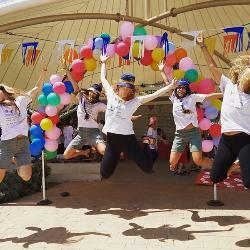 If you don't know, Jordan River Village is Israel's only free, year-round camp for children living with serious illnesses and life-limiting conditions. Opened for only 7 years, we've changed the lives of 10,000 campers, strengthened thousands of families, empowered scores of communities, and enhanced the entire country to Israel!!!! As a member of SeriousFun Children's Network, we are so excited to participate in The 2018 A&F Challenge!!! Through this extraordinary partnership with Abercrombie & Fitch, we are increasing awareness of the life-changing impact of camp for children living with serious illnesses and their families, and raising support for camps and programs like ours so that we can continue to serve our campers and their families totally FREE of charge! We hope you will show your support for our team and help even more kids experience the power of possibility and the magic of camp! For more information, please contact Gail Androphy, Executive Director, American Friends, at gail@afjrv.org.